Some of the most elegant and morphologically interesting and showy trilobites come from the Devonian strata of Morocco. 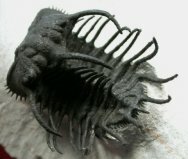 And, in recent years, availability in Morocco of modern pneumatic and air abrasive equipment have enabled fine preparation of a highly diverse assemblage of trilobites. Coming from extremely hard limestone, such preparation takes many hours to days depending on the species, a task that can be cost-prohibitive if done in the U.S. Historically, many Moroccan trilobites have been and still are prepared, literally, with hammer and nail, often requiring extensive restoration and giving a still poor result, but an extremely low cost. The Moroccan trilobites at Fossil Mall have been laboratory-prepared with the new modern equipment in Morocco, and some in the U.S. The result is beautiful trilobites, with minimal flaws and minimal or no restoration, and very often with three dimensional aspect. Currently, identifications and names of Moroccan trilobites are in a state of flux, if not chaos. For a number of complex reasons over many year's, common "slang" names for genus and species of Moroccan trilobites became widely used, some of which were taxonomically misleading. Where possible, we will provide the old slang, as well as new or prospectively new names. Hopefully, the future will see new descriptions appear and consensus and clarity in taxonomy emerge. There are many trilobite bearing outcrops ranging from the Cambrian to the Devonian.